Every work of fiction has a “personality,” a way of speaking to a reader, a conversational tone or feel. It makes sense that the tone of most books are a reflection of the author’s own personality. Some books seem aggressive, some timid, some somber, others jovial. Often, the plot also plays a role in determining the book’s personality. I found The Story of Edgar Sawtelle‘s personality to be especially remarkable. The book is even-tempered and unassuming; almost matter-of-fact but with a hint more warmth. Even though the plot traverses through tragedy, surprise and moments of excitement, the book presents the whole story with a pure, quiet simpleness that results in a sense of truthfulness. If you read through a surprising plot twist and it makes you feel angry or sad or nothing at all it’s because that’s how YOU feel, not because the book has manipulated you to feel that way. While I was in the middle of the book someone mentioned to me that this new author, David Wroblewski, was being compared to John Steinbeck and I thought “YES!” That helps me put into words the unusual personality of this book – Steinbeck’s raw openness, unashamed and often unemotional – that feeling that has come to be described as “American” in literature. The Story of Edgar Sawtelle is VERY “American.” It’s essentially an American Hamlet story complete with love, betrayal, ghosts and revenge, but these dramatic topics are tempered under the comforting blanket of everyday life in heartland America. The title character is a boy living with his parents in Wisconsin on a farm where they raise, train and sell a fictional breed of dog known for its exceptional companionship. Even though Edgar is mute, he helps train and care for the dogs, using sign to communicate. When Edgar’s father’s brother shows up, tensions rise. Edgar’s uncle (Claude) has different ideas about how to do things and seems to still be holding a grudge against his older brother. After Edgar finds his father’s body in the barn, with no apparent cause of death, he begins to suspect his uncle and is determined to find a way to prove it. Completely separate from the Hamlet theme, but integral to the story is the giant red barn on the Sawtelle property. A great deal of the action takes place in the barn and it could even be described as being one of the main characters. The barn witnesses betrayal and murder, is a home for the Sawtelle dogs – where they are born and trained, and is a guardian of the history of the dogs’ bloodlines and of the Sawtelles themselves. It is, of course, iconically American. 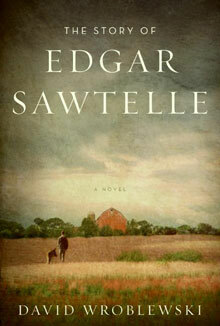 The Story of Edgar Sawtelle was one of those books, when put down, left me feeling both happy and sad. Happy to have experienced such a great piece of literature and sad that it was over. The book’s unassuming personality allows you to take exactly from it what you want, which is incredibly satisfying.